A headstall for a horse is a hanger put on a horse's head used for holding a bit, bosal, nose piece, or other piece of equipment to communicate with a horse while riding. Western horse headstalls come in two main types, browband and one ear. Our article and photos below describes the main parts of both types of these headstalls. As we said above, a headstall is a hanger put on a horse's head used to hold a bit, bosal, nose piece, or other piece of equipment to communicate with a horse while riding. When a headstall is combined with a bit (or bosal, nose piece, etc.) the combination is known as a bridle. Below is a photo of a bridle with a leather headstall. Underneath the photo is a description of its main parts. Below: The main parts of a horse headstall. The browband. The browband goes in front of the horse's ears, across the brow. Its purpose is to keep the headstall from sliding down the horse's neck. 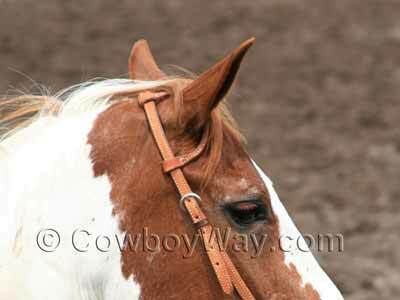 If a headstall does not have a browband it will probably have an ear piece (see One Ear Headstalls, below). The purpose of the ear piece is the same as the browband: To keep the headstall from sliding down the horse's neck. Western Headstalls also commonly have another style (besides a browband) called a "one ear." Instead of a browband, one ear headstalls have an ear piece that goes around one of the horse's ears. It serves the same purpose as a browband, which is to keep the headstall from sliding back. In the photo of the one ear headstall below notice that the ear piece is its own individual piece of material (in this case, leather) and is designed to slide freely. This allows the ear piece to be slid along the top of the headstall to the best location to accommodate the horse's ear. There are also headstalls that have an ear piece for each ear. Logically, these are called "two ear" or "double ear" headstalls. Below: A one ear headstall. Some one ear headstalls have a piece for the ear cut right into the headstall. These are commonly called "fixed ear" headstalls. Since the earpiece is in a fixed location, it cannot slide freely. 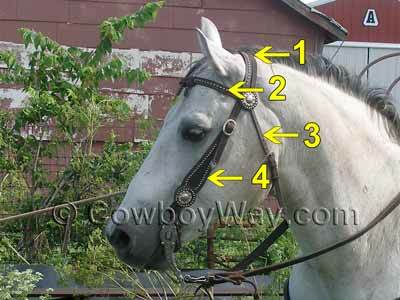 Below: A fixed ear headstall. Still another type of one ear headstalls (not shown) have a split cut into the crown piece for the ear instead of a separate piece. 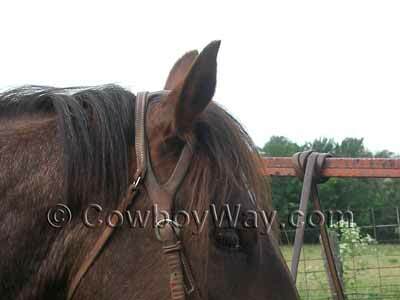 "Split ear" headstalls are popular with many riders, but care must be taken to adjust the headstall so that the split does not rub the horse's sensitive ear. Headstalls come in a nearly endless variety of styles made from a wide variety of materials. Common materials include leather and horsehair, and synthetics such as nylon and biothane or beta biothane. Some headstalls come with bling in the form crystals, fancy buckles, or other eye-catching accents. 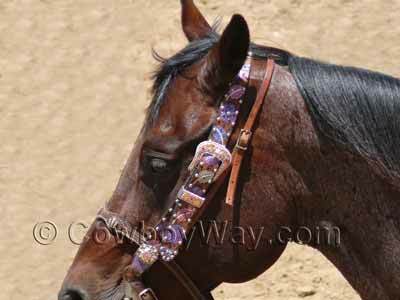 Below: A fancy headstall with bling.